We always plant flowers and stuff around the property/garden to promote bees and to increase pollination of our fruit trees and garden plants. Himalayan Balsam (Impatiens glandulifera) Almost a weed or invasive species. Way past easy to grow as long as it is watered regularly. The hard part is keeping it under control, I pull up at least half. Bee's love the stuff and it flowers after midsummer up until the first frost. It keeps the Bees going in the late summer when many other flowers are finished or over with. 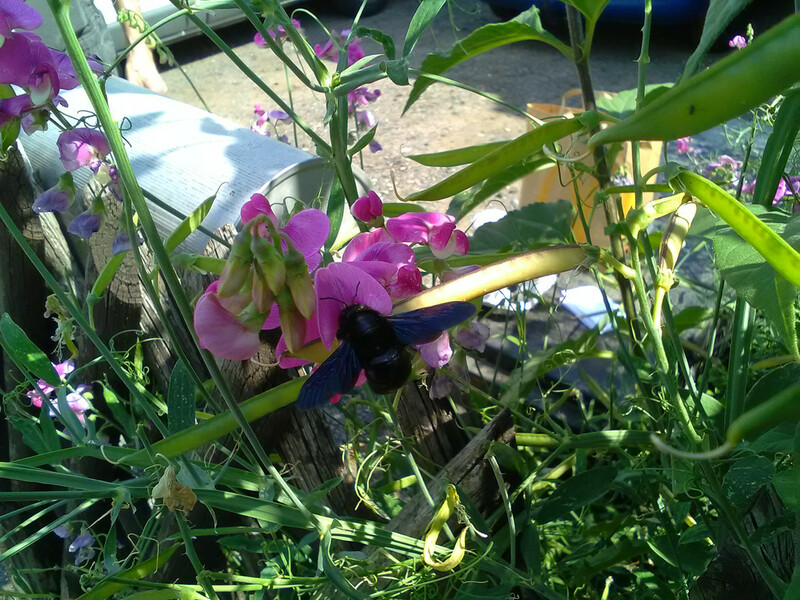 I plant a lot of Bee-friendly flowers and plants, dual-purpose, good for the Bees and tasty for people. Goose Berries, Raspberries, BlackBerries and even English Ivy ( https://phys.org/news/2013-04-honey-ivy ... -bees.html ). A lot f my gardening is pulling and cutting the overflow. Lemon Thyme is another good one, edible and a perennial, way easy to grow. Basil is always a hit with the Bees. Last edited by Hessian on Sun Apr 14, 2019 11:56 pm, edited 1 time in total. Yep, most of our property is planted with native or xeric adapted plants that are hosts to pollinators and butterfly larvae. We grow Datura to move the sphinx moth larvae to from our tomatos. We also have nesting blocks with holes for orchard and leaf cutting bees, and a structure for over wintering invertebrates. Here in the desert, not much planting going on. I do try to cultivate the blooming vegetation and plants that produce some sort of sustenance for my wild critters. But then again, I didn't plant them for the bees, I planted them for myself, the Bee just help pollinate them. We have a good sized patch of clover in one corner. When we took over the property there were tons of rose bushes in a row that had grown wild and out of control - had been neglected and untended for about 20 years and were choked off and just a non productive mess. We cleaned them up and heavily trimmed and pruned them back removing anything completely dead and they remnants have come back with a vengeance and put on a terrific display of blossoms and flowers but we did have to get rid of about 60% of the footprint. We do have tulips and some perennials that border the Ivy beds. There is a range of illumination from direct exposure to heavy shade that allows for many disparate environments and mini ecosystems. We do plant and tend to tomatoes and eggplants and summer squash that require active tending and attention but the balance of the yard is weekly maintenance aside from spring and fall cleanup and prep. I like to think it's a net positive and that we do our part. I don't plant with bees in mind but the apple trees, peach trees and a natural weed lawn with all nature of flowering plants coupled with ZERO Sevin used creates a good dinner plate for pollinators and does not kill them off. Plenty of farmers fields around with clover, alfalfa, sunflowers, and a variety of grains. IMO if you want to help the Bee and related wild Bees or even Wasps you plant with the thought in mind to have something they like blooming in spring, summer and fall. Spring is usually boom time for the Bees, there can be dry periods for flowers. Some flowers they ignore. Garden Vetch (vicia) is a winner, perennial. A little hard to get started but once started it is pretty much idiot proof. Drought doesn't really affect it unless it is really drastic. Location: Extreme NE TN, W NC. (But) With Nectarines added as well. Not into Harsh Chemicals all over my yard in order to eradicate "Stuff." Wasps eat a wide range of invertebrates including spiders, caterpillars, ants, bees, and flies. It has also been suggested that wasps may prey on nestling birds. Wasps also collect honeydew. Honeydew is produced by a native scale insect.